This is a simple tuning fork mounted on a varnished ash sounding box. This item was found buried in a grave marked "John Shore" during a repurposing of a cemetary. Marshall, Carter and Dark claimed the item after the unexplained deaths of three of the excavator crew. Item is to be tested in a standard soundproofed environment room. Standard "Waldo" robot with dual grappling arms to conduct experiments. Remote viewing of experiment is to be conducted via Waldo's onboard camera with sound turned off. No humans are to enter the room during testing. When not in use, item is to be packaged in form fitting foam and placed in a soundproof box. Testing is to be performed to find out if this item caused the deaths of the excavator crew, how it did it, and whether Marshall, Carter and Dark can build more. One white mouse in a steel cage was placed 1 metre from the tuning fork. The fork was struck with a 20cm metal probe moving at 3m/s so that it would resonate. Upon striking the tuning fork, the mouse froze in place and appeared to shiver slightly. After 7 seconds the mouse ceased moving and expired. 10 white mice, each in a steel cage were placed at 3 metre intervals from the tuning fork, along with decibel meters at each location. The fork was struck with a 20cm metal probe moving at 3m/s. The mice at 3, 6, 9, 12, 15, and 18 metres all froze immediately. The mouse at 21 metres shivered slightly and ran to the far end of its cage, squealing. After 7 seconds all 6 mice from 3-18 metres stopped shivering and expired. The mouse at 21 metres expired after 9 minutes. Each of the 8 white mice affected were dissected and examined. No damage was found to any of their major organs which would explain the deaths, but an analysis of their blood showed that the haemoglobin molecules had completely decomposed into their component atoms. The mouse from Experiment #2 at 21 metres showed similar but lesser signs of haemoglobin disintegration. Samples of the tuning fork and the sounding box were tested using an inductively coupled plasma mass spectrometer, an x-ray flourescence mass spectrometer, and a Marshall, Carter and Dark's "1001 really cool science experiments for boys" kit. Results showed that the sounding box was made entirely from the wood of an ash tree, covered in a varnish consisting of pine resin and human blood. The tuning fork itself was made from an alloy of 80% tin, 7% zinc, 7% vanadium, 5% silver, 1% rhodium. MC&D's "1001 really cool science experiments for boys" kit was used to manufacture more of this alloy. 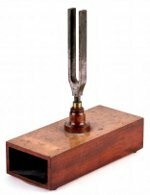 A copy of the tuning fork and sounding box was created from their raw materials in the exact dimensions of the original. The duplicate item was placed in the testing chamber and Experiments #1, #2 and #3 were rerun using the duplicate. Results from the duplicate Experiment #1 were identical to the first. Results from the duplicate Experiment #2 showed the mouse at 21 metres surviving. Results from Experiment #3 showed a 10% decrease in the amount of haemoglobin disintegrated in the mouse at 15 metres, a 30% decrease in the mouse at 18 metres, and an 80% decrease in the mouse at 21 metres. This device appears to vibrate at the resonant frequency of the haemoglobin molecules found in the blood of living creatures, causing immense pain followed by death to those within the area of effect. This effect has been duplicated in the lab with an identical copy of the original device. Analysis of the waveform produced by the tuning fork shows an intense vibration in the 9.3-9.5GHz frequency range. Duplicates of this device have been approved for sale. This device is approved for testing as a type 2 sonic trap.